The forthcoming Office 15 suite from Microsoft will, according to a select few who have access to the Technical Preview of Office 15, have “touch-mode” to help enlarge the ribbon interface along with other UI elements which are there in apps. 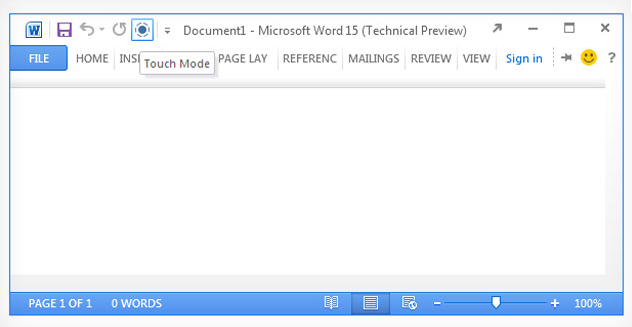 The feature has been introduced by Microsoft is a number of applications through a “touch mode” button which activates the upcoming “Office Personality” plans Microsoft has had for Office 15. The mode was first noticed by ZDNet's Mary Jo Foley, will not only have animation for a few Office features, but bigger icons and more spacing in the ribbon. The touch mode version does not completely work in the new Technical Preview of Office 15, but the feature is expected to ease up the process of typing on Office 15 through a tablet device. Although, much news hasn't come out regarding the radial menus in the preview, people are expecting this menu style to be out for the OneNote Metro style application, and not for the desktop versions of Office 15. The Office 15 applicatons are currenltly in the Technical Preview with beta coming up in the summer, and we hear that some of these applications will be included by Microsoft as part of the Windows on ARM.